Ludovina Menezes a government school teacher from Goa who was born and grew up at Molla Guirdolim, was presented the prestigious Global Teachers Award recently by MVLA Trust at a function held at Hyderabad making her the only Goan to get this award. Ludovina hailing from Velim has been a teacher right from the time she was studying at Chowgule college when she started teaching the primary classes. After working in the primary school for four years she taught at Chandrabaga Tukoba Higher Secondary School for two years. Then she was appointed a teacher at a Government High School for the last 30 years has taught at different high schools in Quepem and Sanguem talukas. She taught at the Rivona Colomb school for 12 years. Ludovina who has Masters degree in English and also in History has the distinction of teaching first generation learners and getting cent percent results from them at the Goa Board of Secondary and Higher Secondary Education. 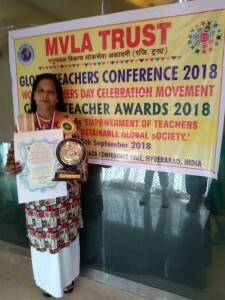 Earlier in recognition of her services the Government of Goa had conferred upon her the State Award for Best Teacher in the year 2014 and now she has bagged this Global Teacher Award from MVLA Trust. Ludovina is the daughter of Santano Menezes and Carlota D’Costa from Guirdolim.